Tony Blair has opened a new national railway museum on the site from which the first public steam train departed almost 180 years ago. Locomotion: The National Railway Museum in Shildon is based at the first departure point for the Stockton and Darlington Railway in 1825. A large police presence kept around 30 pro-hunt supporters away from the prime minister during the ceremony. 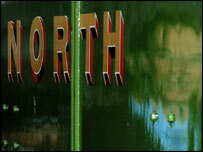 Mr Blair also posed for pictures in the world famous Flying Scotsman. He said: "They have done a magnificent job and it is fitting that it should be in Shildon. It would not have been done without the support of local people. "This area has gone through a huge change in recent years and to try and build something new which also includes our history, is a wonderful thing to do." Mr Blair was taken on a tour of the museum, which has opened in partnership with the existing National Railway Museum in York.